﻿ Figo: "It's impossible to stop Cristiano Ronaldo when he's on top of his game"
12.10.2011 » Figo: "It's impossible to stop Ronaldo when he's on top of his game"
Luis Figo is a confessed fan of Cristiano Ronaldo and both players certainly know how hard it can be to handle the pressure of playing for Portugal and Real Madrid. In an interview in Monte Carlo for Golden Foot awards, Figo pointed out that when Cristiano Ronaldo is at the top of this game, it is impossible to stop him. Not too long ago, Luis Figo and Cristiano Ronaldo "cohabited" the same locker room, everytime the Portuguese National Team had a scheduled game. Seen by many as two of the most illustrious players of the last decades, both Figo and Ronaldo are aware of the responsability of holding an entire country's hopes on their back, as well as the media pressure coming from Madrid. Figo has a well-formed opinion on Cristiano Ronaldo, as he believes CR7 is unstoppable when he's perfectly fit and on top of his game. 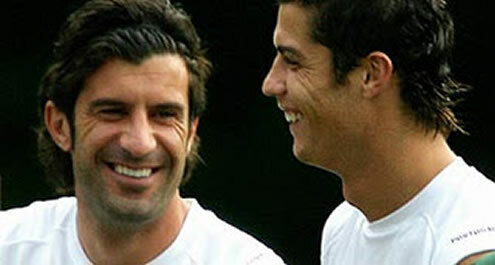 Luis Figo: "The current Portuguese National Team has enough quality to qualify for the Euro 2012. With players such as Cristiano Ronaldo, Nani, Bruno Alves, João Moutinho and Raúl Meireles, I can't imagine a scenario where Portugal wouldn't be playing in the EURO 2012. ", said the former Barcelona, Real Madrid and Internazionale memorable player when assessing the Portuguese National Team potential. When asked to comment how important Cristiano Ronaldo is for Portugal, Figo was peremptory: "Cristiano Ronaldo is crucial and tremendously important. He's one of the best players in the World. When Ronaldo is on the top of his game, he truly is unstoppable. ", outlined Figo, emphasizing how decisive it will be for the Portuguese National Team that CR7 can perform at his best, so they can beat thoughest opponents. Figo refused to join the media chorus of criticism when regarding the differences on Cristiano Ronaldo performances for Real Madrid and the Portuguese National Team. Figo: "I disagree with those arguments indicating that he doesn't put the same effort in the club and the "Selecção". We can't compare these two realities simply because they are completely different. ", noted the former Portuguese player, using an insight that could also be applied to Lionel Messi's performance dichotomy in Barcelona and Argentina. Cristiano Ronaldo has now headed back to Madrid, in order to prepare the next scheduled Merengues fixture. You may watch Real Madrid vs Betis live streams this Saturday, in our Soccer Live Streams section. The countdown clock timer, displaying the time left for the next Ronaldo game, is shown on the top right corner of all pages. Next Saturday, the Premier League also returns and you can follow Liverpool vs Manchester United online, as well as Barcelona vs Racing Santander live. All streamings are provided from our "Live" section.